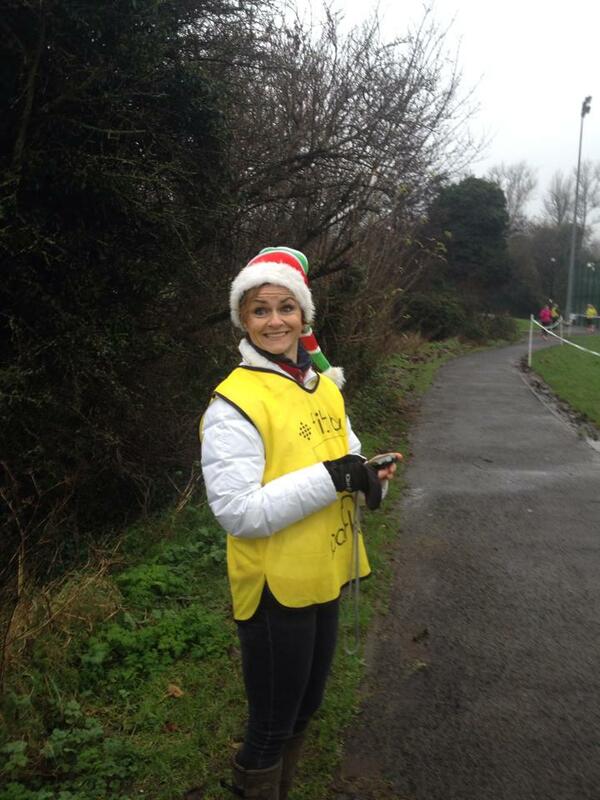 A few Seaparkers braved the weather on 5th December to attend the home parkrun at Carrickfergus. 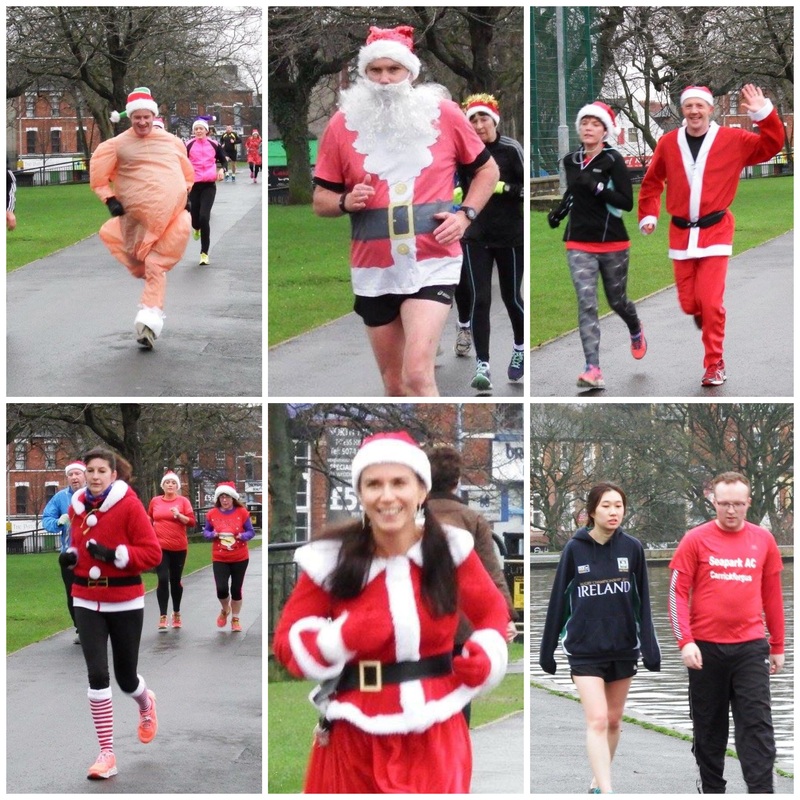 Charlie McCormick was 2nd over the line (+ first Searparker) and was followed by Clive Weatherhead (who achieved a 1 second PB of 19:58 on his 75th parkrun), Brendan Rice, Robert Steele, Jonathan Beattie, Gareth Hamill, Derek Kane, Marie Nicholson, Glenda Murray and Michael Kane. 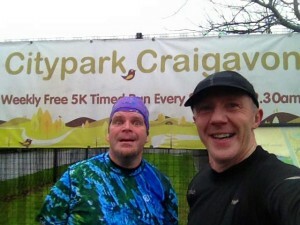 Quite a few Seaparkers went to the third B2R event in Loughgall on 5th December, but that didn’t stop Bobbie Irvine and Neill Harper going to the Citypark parkrun in Craigavon beforehand. This was their 2nd appearance each @ Craigavon. Neill Harper even managed to get a PB of 25:46 for the course. His overall PB is still 24:18 (@ Victoria) so he must have been walking the Citypark course the first time if 25:46 is a PB for him. Craig and Ross Gilmore both attended their 1st Waterworks parkrun. They’ve only did a few parkruns each so far but it’s beginning to look as if they’re going to be parkrun tourists, having attended Antrim, Carrickfergus and now Waterworks in the last few weeks. 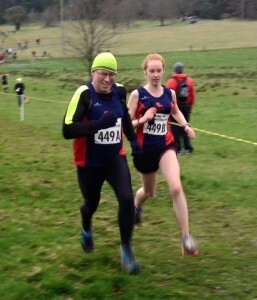 Robert Murray and Trevor Lamb both went to the hill(y) Valley parkrun. Will the Back to the Future puns ever end? Robert was the 7th athlete home. Not bad for his 75th parkrun and 6th run @ Valley. This was Trevor’s 4th appearance @ Valley. The last time he went was in March 2015 and achieved a time of 27:51. 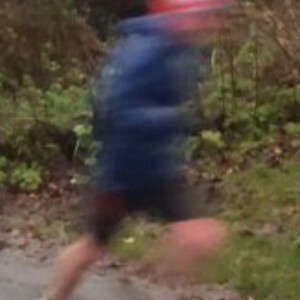 This time he missed out on his Valley PB by 2 secs (!!!) and got 27:53 (for those that can’t count). He wasn’t a happy bunny. Shouldn’t that be wolf? Charlie McCormick gets another mention (as lets face it, he’s the talk of the town) as he completed his 50th parkrun (and his 46th @ Carrickfergus) on 12th December. Not a PB but his Carrickfergus parkrun time is still 1 second faster than Bobbie Irvine, so in the end that’s all that matters. He was quickly followed by Brendan Rice, Jonathan Beattie, Gareth Hamill, Andrew Smyth, Derek Kane, Neill Harper and Marie Nicholson. 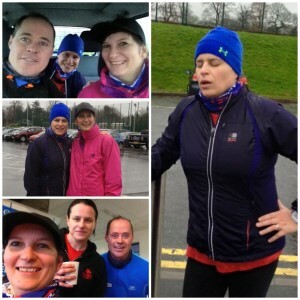 Bobbie Irvine, Philp Poag, Trevor Lamb, Alison Welsh and Michael Kane attempted to go to Colin Glen but it was cancelled due to Glenda Murray poisoning all the volunteers so Trevor Lamb couldn’t run. I think that’s what happened. It was either that or black ice, one of the two. 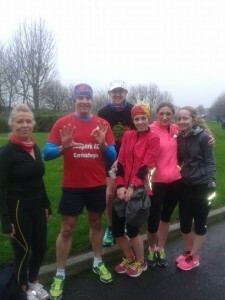 Anyway the Famous Five had 15 minutes to get to the nearest parkrun (which was Falls) and only Bobbie knew the way. 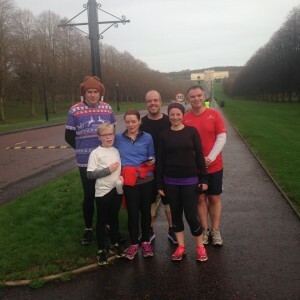 Luckily they got to the (not as hilly as Larne or Valley, never said it was flat) Falls parkrun with over 5 mins to spare. 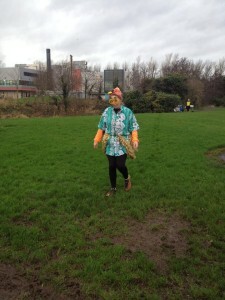 Bobbie Irvine was the first over the line (Go Seapark!) and was followed (noticed I didn’t say quickly followed) by Philp Poag (first run @ Falls), Trevor Lamb, Alison Welsh (first run @ Falls) and Michael Kane (first run @ Falls). The devious Glenda Murray (not knowing that her plan to stop Trevor Lamb from running had failed) went to Queens with Robert Murray (PB @ Queens of 21:22) and Karen McMaster (PB @ Queens of 29:38). The 12th also saw Karen Waring return to Valley, knocking over a minute of her time from a few weeks back @ the same location (31:59 on 21/11/15 and now 30:53 on 12/12/15). Getting back to form Karen! 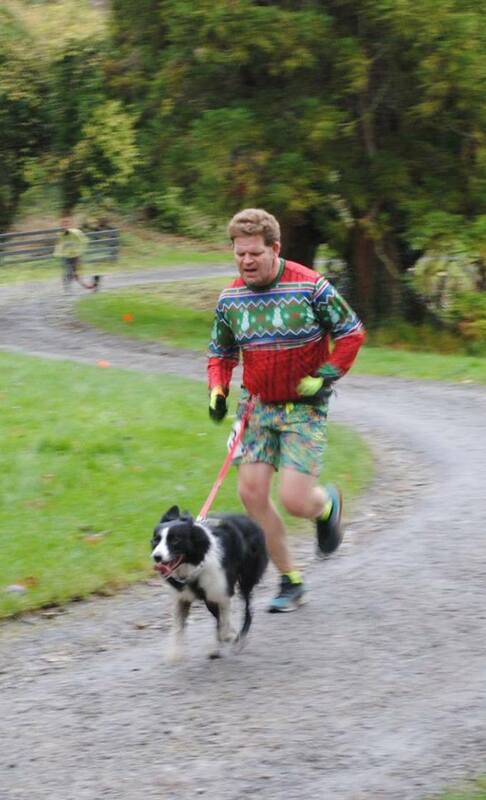 The Christmas Tree medal for B2R’s Tollymore wasn’t enough to deter the hard-core parkruners as a few still managed to make a parkrun on the 19th December. Clive Weatherhead, Robert Murray, Jonathon Bell, Derek Kane and Glenda Murray did the Carrickfergus home parkrun on this date. There was no PBs this week but it didn’t matter as there was very festive upside down pineapple cake on offer for everyone who attended. For parkrun tourism the 19th was a weekend of firsts as it saw Karen McMaster partake in her first Hampstead Heath run, Robert Steel his first Ecos run, Gary Craig his first Ormeau parkrun + Philip Poag, Karen Poag, & Allan Grant completing their first (not at all hilly) Stormont parkrun. Trevor Lamb and Julie-Ann Mitchell also went to Stormont on 19th but because it wasn’t their first run there no one really cares. On Christmas Day Seaparkers had the choice of either Waterworks or Victoria. The turkey was on the loose @ Waterworks with Charlie McCormick (yes, him again) dawning the infamous outfit from last Christmas. Gobble? Gobble? 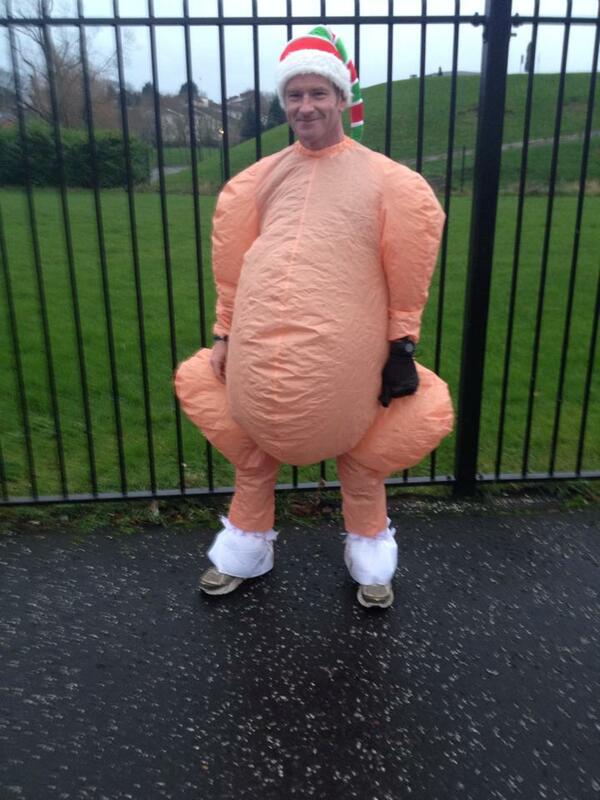 went the turkey but no-one was biting. Robert Murray was the first Seaparker home and was the only one not to be McTurkeyied (not sure how to spell that but spell check wants me to change it to McMoisturised) by Charlie McCormick who was the 2nd Seaparker home. They were followed by Trevor Lamb, Karen Poag (with new Waterworks PB of 25:59), Bobbie Irvine (running with Jog’s Nicola Irvine), Karen McMaster (who thanks to a Christmas miracle got an overall PB of 29:08), Glenda Murray, Karen Waring, Philip Poag, Elise Park (on her first run @ Waterworks) and Gavin Irvine. Christmas miracle’s weren’t restricted to Waterworks because they got one at Victoria also. 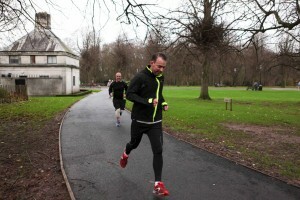 Andrew Smyth got an overall PB of 23:20 on his 50th parkrun (and 10th @ Victoria). You really can’t make this stuff up people. Andy must have been on the good list but I don’t know why. First Seaparker over the line at Victoria on Christmas Day was Ryan Weatherhead & he was followed by Clive Weatherhead (though technically he could have been first as both got 20:04), Alanah McCombe, Lynda Shannon, Jonathan Beattie, Andrew ‘Still grumpy even with a PB’ Smyth, Aimee Weatherhead and Ann McCracken (with a new Victoria PB of 26:44). There was no Christmas Day parkrun @ Carrickfergus but on the 26th December quite a few Seaparkers stayed for the home parkrun (unfortunately there was no upside down pineapple cake to be found). Ian Cleland was the first runner home with 19:07 (Congrats). He was closely followed by Charlie McCormick, Mark Welsh, Jonathon Bell, Robert Steel, Allan Grant, Philp Poag, Derek Kane, Trevor Lamb, Karen Poag, Carol Woods, Alison Welsh, Karen Waring, Marie Nicholson, Glenda Murray, Karen McMaster, Rebecca Tester, Michael Kane, Susan Kane and Julie-Ann Mitchell. 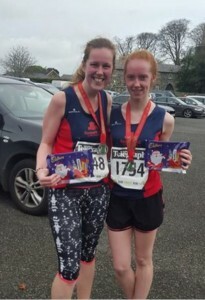 Karen Waring got a PB of 28:13 for Carrickfergus + Karen McMaster’s Christmas miracle continued into Boxing Day as she got a Carrickfergus PB of 29:26. No PBs for anyone else. So you can use the excuse that you where still full from your Christmas dinner and/or you where saving your energy for the Seapark AC Boxing Day Forest run a hour later. Either excuse is valid with me. Though I know a few of you want to say that your shoe laces came undone (yes, that old chestnut). You know who you are. 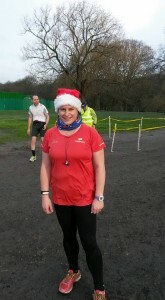 Angela Mcormick showing off a new parkrun vest. 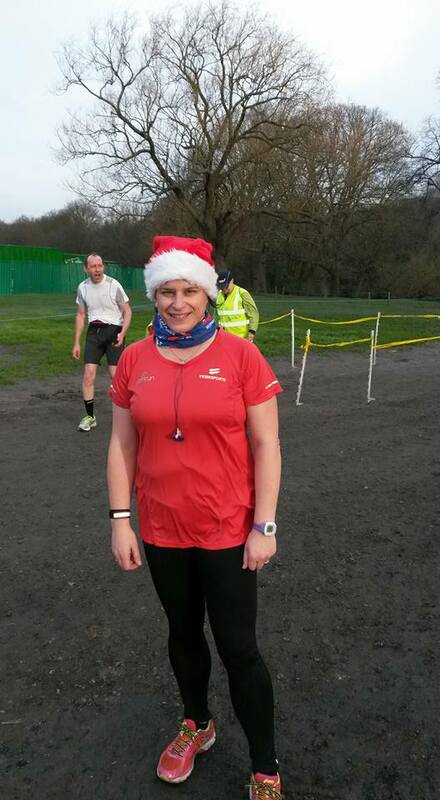 Sara Johnston made up for missing out of the Christmas Day parkrun @ Waterworks by going there on 26th, obtaining a PB for Waterworks of 29:45. 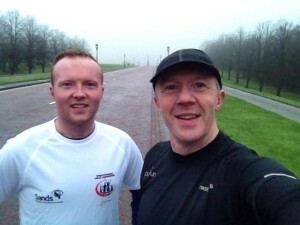 While Richard Hetherington went on his first visit to Ecos parkrun, Ballymena on 26th and Bobbie Irvine & Gavin Irvine finished of the 2015 parkrun year with a very foggy Stormont parkrun. Maybe Gazza can do a remix of Fog on the Tyne? Fog on the Hill has number one wrote all over it. We are still waiting to hear back about Andy’s 2016 parkrun challenge but there have been a few other challenges announced. Michael Kane has put forward the suggestion that we should do a Seapark NI parkrun challenge. 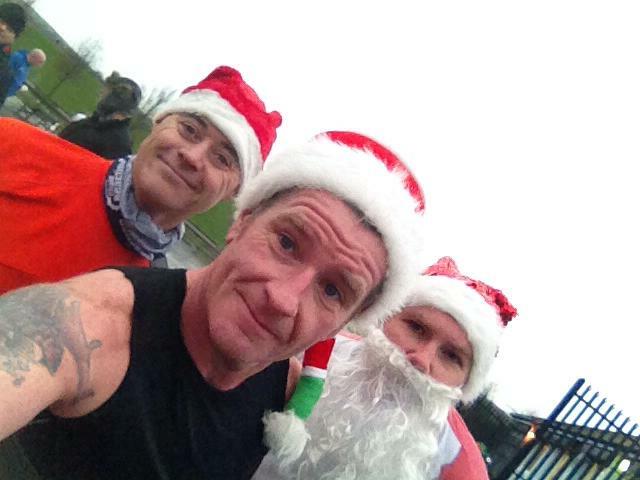 All participants will have to run @ least once @ all 22 of the NI parkruns in 2016. Let’s hope they don’t add any new ones. So far we have Vivien Davidson, Carol Downey, Allan Grant, Derek Kane, Geraldine Kane, Megan Kane, Michael Kane, Julie Kelly, Bobbie Irvine, Trevor Lamb, Glenda Murray, Robert Murray, Becki Tester and Karen Waring showing interest. 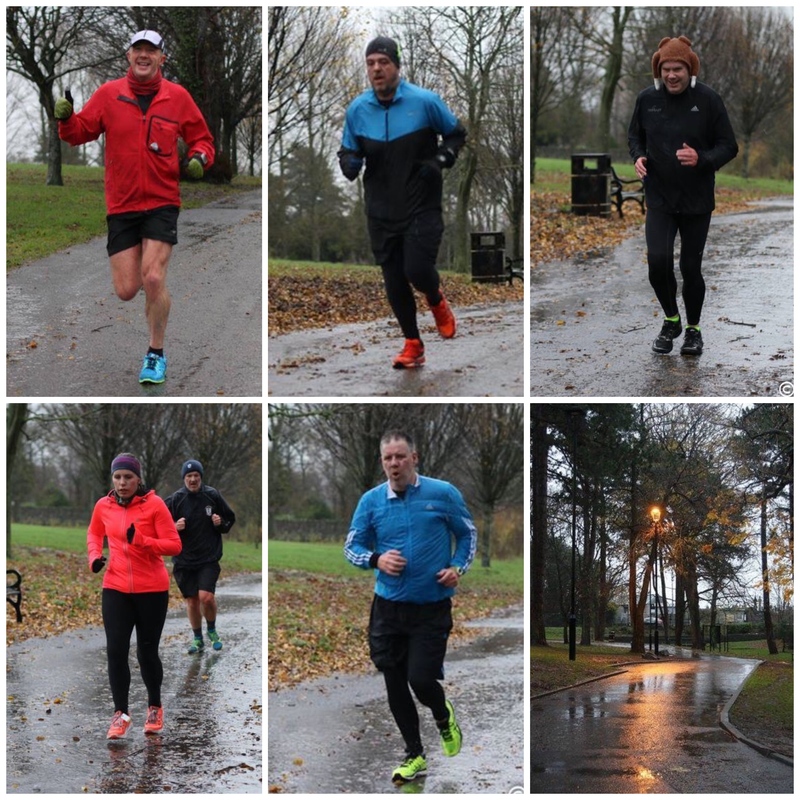 A Seapark AC 2016 NI parkrun challenge Messenger group has been set up (so as not to overflow the Facebook group). If you would like to be added to it let either Michael Kane or Trevor Lamb know. You may not want to do all 22 but you probably want to go to as many cakeruns as you can. Some of you may be wondering why the devious Glenda Murray would want to stop Trevor Lamb from running. 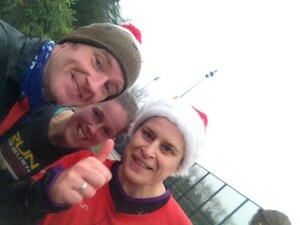 Well, the 2nd parkrun challenge is specific to Glenda Murray and Trevor Lamb. 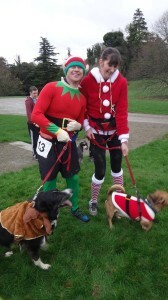 Both of them ran their 50th parkrun on 15th August, so the race is on to see who reaches their 100th first. At the end of December Glenda is at 60 while Trevor is at 62. Race to 100 Team Trevor (AKA Team Wolf) and Team Glenda (AKA Team Devious) t-shirts will be on sale soon. Choose you side wisely. 28 runners travelled to Castlewellan to take on the annual Christmas Cracker trail race. This year the course was 8.6 miles and took runners through the beautiful surroundings of Castlewellan Forest and all the way to the top of Slieve Croob where the views were stunning. Santa’s and Turkey’s were amongst the athlete’s who paired up to take on the muddy tracks, steep hills of the tough but enjoyable race. First crossing the line for Seapark were Bobbie Irvine and Charlie McCormick completing the 8.6 miles in 71 minutes. Pictured – Wesley Wallace and Jennie Haggen. 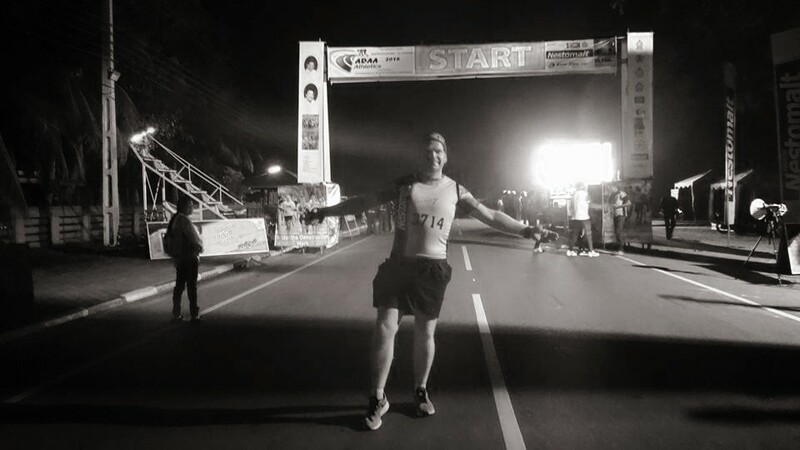 Seaparkers Neill and Yumi travelled to Sri Lanka to take part in the Aruradhapura Ultra. Due to the very hot conditions the 21km event started at 5:30am however sounds like the early rise was well worth it as Neill Harper said ‘the scenery was stupendous‘. 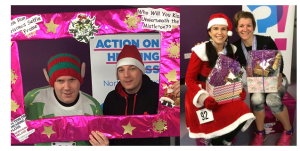 A goody bag, water, mulled wine, mince pies & prizes! were the attraction for Oska, Cody and Basil at the Castleward Christmas Waggy Races today. The National Trust Castle Ward Estate is one of NI’s most beautiful locations on the shore of Strangford Lough and provided good surroundings for Oska, Cody and Basil’s two legged running companioins – Seapark’s Glenda and Robert Murray and Neill Harper. Seaparkers got into the festive spirit today at Action on Hearing Loss NI Hazelbank 5 mile race. First home for Seapark ladies was Gillian Cordner in 36:12, 2nd lady and on the podium with Gillian was Karen Waring taking the prize for ‘Most Festive Dressed’ lady. The third event in Born 2 Run’s Run Forest Run Series took part today in wet and windy conditions at Loughgall in Co Armagh. As with the other races in the series the course took in the picturesque village of Loughgall and Loughgall Estate. Today’s course was shortened due to flooding bought about by the recent bad weather conditions. 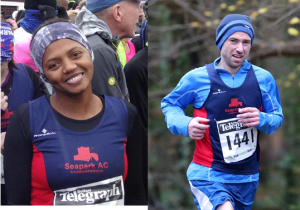 First male home for Seapark was Ronald Simms in a time of 35:49 and Elisoa Crawford, first Seapark lady, put in an impressive performance to finish in a time of 36:39 placing her as 6th lady finisher.